The 2019 Movers and Shapers Survey has moved to SEN.com.au. Crocmedia/AFL Record senior writer Ashley Browne has surveyed the footy industry – administrators, players, managers and media – to establish the definitive list of the most influential people in the game. It’s the list those on it claim to pay no attention to, but are secretly thrilled to get a guernsey. Today we round out the survey with the top 10. No real surprises with the first few names on the list, but for the first time in four years an active player has made pointy end of this collection of the most important people in the game. Took to his new role with SEN in 2018 like a duck to water after his surprise departure from the ABC and his morning show was a who’s who of the big names in the game. The same with AFL 360, his nightly Fox Footy panel show that wraps up the news of the day and often sets the agenda for the next. Crocmedia (owner of SEN) has invested heavily in Whateley and with 145,000 listeners a week, the ratings figures towards the end of the 2018 AFL season began to reflect this. What will be interesting down the track is what will happen when the great Bruce McAvaney calls it a day at Seven. Would Whateley, whose prowess at calling not just footy, but horse racing, cricket and the Olympics, mirrors the sports that Seven holds the rights for be interested in one day filling those illustrious shoes? Having delivered AFL players a hard-earned but well received CBA agreement before the start of last season, Marsh then delivered a nice deal for AFLW players as well, with player payment across the 10 clubs totalling $4.478 million in 2019, an increase of 38 per cent per club on 2018. His main focus outside terms and conditions for the current crop of players was the AFLPA’s Injury and Hardship Fund, a $25 million initiative that it is hoped could assist up to 200 past players a year. The current players are tipping in $4 million from their share of industry revenue to finance the fund. This year, attention will likely turn to a review of the illicit drugs policy. Things between the AFL and the players are generally quite harmonious and, while they were well paid for turning up, they threw their enthusiastic support behind the AFLX event at the end of February. Unlike predecessors Andrew Demetriou, Brendon Gale and Matt Finnis, Marsh isn’t considered any chance to work at the AFL or become a club chief executive. He has delivered well for the players and they are likely to want him to remain for considerably longer. “He is determined to create a long-term vision for the players outside the confines of the AFL,” said one associate. The next CBA isn’t due for some time, but he might become the first AFLPA boss to negotiate more than one. Here’s something to consider. If scoring increases this year because of the new 6-6-6 rule, then one of the winners will be Seven, the AFL’s long-standing free- to-air TV broadcaster. More goals means more ads. More ads means more money. Don’t think for a moment Seven proprietor Stokes and his senior management team aren’t delighted with the new rules and interpretations designed to increase the flow and the spectacle of the game. In all likelihood, they made their views clearly known to the AFL. We are still a few years away from the AFL’s next round of media negotiations, but if recent examples overseas can be taken as a guide, TV rights fees are starting to flatten out and perhaps even slightly decline. So if scoring is up and Seven can help sell more fast food, cars, beer, banking services and sports betting, then football stands to benefit down the track. At least that’s the theory. It all seems so effortless for the 2016 Brownlow medallist, who can glide seamlessly between starring for the Cats, juggling various media roles and some business interests and heading up the AFLPA. If anything, football was a bit of a struggle for the 28-year-old who battled a nagging back injury last season. He was good, rather than great for much of the year but has reportedly trained the house down in preparation for the coming season. But as a media performer, he earned maximum votes and as a social media influencer, he earned huge praise as well. “He gets the importance of interacting with the media and sets the tone for his peers. Where ‘Danger’ goes, others will follow,” said one senior journalist. He hasn’t been an extremist as the players’ leader by any stretch, but he makes sure their views are known and communicated to those who need to understand them. The consequence of the hard-fought CBA win 12 months ago was that the players threw their support behind ventures such as AFLX, for which he was a team captain and No. 1 spruiker. “His opinions are sought on the decisions that matter,” said another observer. He lasted less than 12 months as host of The Footy Show in 2017, yet his star has risen further since. Having already established AFL Nation as the largest AFL radio broadcaster in Australia, 2018 was spent bringing 24/7 sports broadcaster SEN 1116 into the Crocmedia empire. Not content with one station, however, he now has two, with SEN+ broadcasting on 1377. And SEN is now back in Adelaide as well, with several hours of specialist programming for the South Australian market. But he didn’t stop there. In July he forked out $8.1 million to buy the League’s publishing assets, including the AFL Record and the AFL Season Guide. With some TV properties also part of the mix, and the ever-popular NAB AFL Trade Radio racking up huge streaming numbers each October, Crocmedia is now a major part of the AFL media scene. McGuire’s influence comes from his various media platforms, the club he presides over and 20 years’ experience at said club. The media like to tag him as ‘Eddie Everywhere’, but ‘Eddie Everyone’ might be more appropriate. There is perhaps no one in Melbourne as comfortable in the corridors of power across sport, business, the media and politics and that’s why he remains such a player. He didn’t get his dream of a new stadium across the road from the MCG (and conveniently close to Collingwood’s Glasshouse facility at the Holden Centre), but he helped broker the $250 million deal between the AFL and the Victorian Government that keeps the Grand Final at the MCG until 2057, gives Marvel Stadium its much-needed facelift and provides infrastructure for grassroots football across the state. While he again features at the pointy end of this list, it could be argued that at his own club he ranks No. 3. Football boss Geoff Walsh and coach Nathan Buckley shaped Collingwood the most in 2018. There’s Clarkson the influencer, who by virtue of his longevity and his success, is across everything that happens in footy. He wasn’t on the Competition Committee but didn’t need to be when, armed with a laptop and some match vision, he had a highly publicised breakfast meeting with Gill McLachlan to give his views. In any event, not much happens across the competition without him knowing about it and having input if he wishes. “He’s a footy obsessive. I don’t think he sleeps,” said one of his close mates in the game. Last season was the third straight year that one of his former assistants (West Coast’s Adam Simpson) won the premiership, although this time he didn’t crash the post-match media conference cradling a cold beer for the winning coach. What he did demonstrate last year was that his focus didn’t drift too far his day job. He did a sterling job steering a middling Hawthorn team to a top-four finish after the home and season. The Hawks crashed out of the finals in straight sets and have lost Brownlow medallist Tom Mitchell for this season. For Clarkson, that’s not a crisis but rather an opportunity. 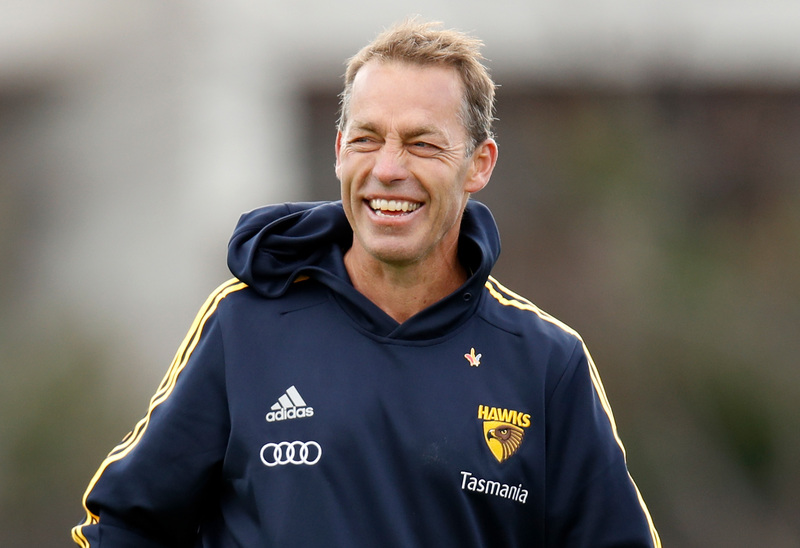 Hawthorn coach Alastair Clarkson is a "footy obsessive"
Whether by design or default, we usually knew former Commission chairman Mike Fitzpatrick’s position on much that was happening in the game, particularly on the field. But two years into his term as chairman of the AFL Commission, the same cannot be said of Goyder, who observers say is fully immersed in League matters and keen to learn more about what he doesn’t know. He might not always be as strident in his views as his predecessor, but he makes them clear once they’re known. Goyder became chairman of Qantas last year, but nevertheless, the AFL signed up with Virgin Australia for another five years last September as its official airline carrier. It is believed Goyder excused himself from the negotiations. It has been a long time since any new arrival at the AFL has wielded as much change within a year as has Hocking. To recap: new judicial and Tribunal processes, new rules and interpretations, headed by the 6-6-6 rule that will lead to real and fundamental changes to the way the game is played, and the shutting down of several key advisory groups to be replaced by the all-powerful Competition Committee. Concerned the AFL’s football IP had fallen significantly behind the clubs, he has assembled a group which includes David Rath, James Podsiadly and Brett Munro, among others, whose knowledge of the game and the players will continue to guide Hocking going forward. Mountains of data, hours and hours of consultation, as well as plenty of wisdom underwrite these decisions and if the end result is the extra three or four goals a game, then Hocking will be hailed a hero. “He will do so much for the game if he’s allowed to,” said one commentator, although all eyes will be on this weekend’s opening round to see how the new rules and interpretations are played out. Record crowds, massive membership figures, bumper TV ratings, strong participation numbers, a women’s competition that is tracking nicely and a $250 million injection of funds for Marvel Stadium and grassroots football represent another solid year of work by the AFL boss. There’s no question he drives the direction of the game and that he’s not prepared to stand still. He consults widely, understands threats and challenges and deals with them on the front foot. He is a modern boss and the AFL is a good place to come to work. Like us, he is a footy head, albeit one who is charged with running the sport. But for all the milestones ticked off in 2018, there were a few blemishes and moments he might want to walk back. Fans were rightfully outraged when he floated the idea of using ‘dead rubber’ games near the end of last season to trial new playing rules and he deservedly copped flak for suggesting the AFLW season be reduced by a week and dug himself a bigger hole by making an incorrect comparison to the FIFA World Cup finals. A thinking-out-loud suggestion about giving Tasmania an AFL team of its own prompted a “put up or shut up” response from Hawthorn president Jeff Kennett. He even made headlines in Canberra when he lobbied the Federal Government for help in stopping the deportation of his cousin’s French au pair. There is not the slightest suggestion the Commission is anything but delighted with his body of work. But observers inside and outside the game noted the mis-steps and have wondered whether the Commission has yet turned its mind to life after McLachlan, who next month will have held the job for five years, which is approaching the mean for someone in his position. Five years into Andrew Demetriou’s time and McLachlan had been clearly identified as the CEO in waiting. “In many comparable sized businesses, the board would have discussed succession planning and a clear No. 2 within the organisation would likely have been identified. That doesn’t seem to be the case at the AFL,” noted one analyst.